The Rare Brunch takes its steak as seriously as weekend warriors take their brunch. Indulge in a wealth of elaborately prepared beef at The Porterhouse. Sample a diverse selection of tartares, slabs of steak cooked to perfection, and a side of masterfully paired wine. When the meat sweats strike, cool off with a cocktail in the hotel's gorgeous pool and relish the scenic view. MenuPages.ae recommends: Steak tartare, lamb lahmacun, and smoked beef loin. Good to know: The Rare Brunch is priced at 350 dirhams for soft drinks and 495 dirhams for house beverages. Kids dine for 100 dirhams. Saturday and Sunday brunch run from 12.30PM to 3PM. Enjoy a picture-perfect weekend at Al Maeda's poolside brunch. 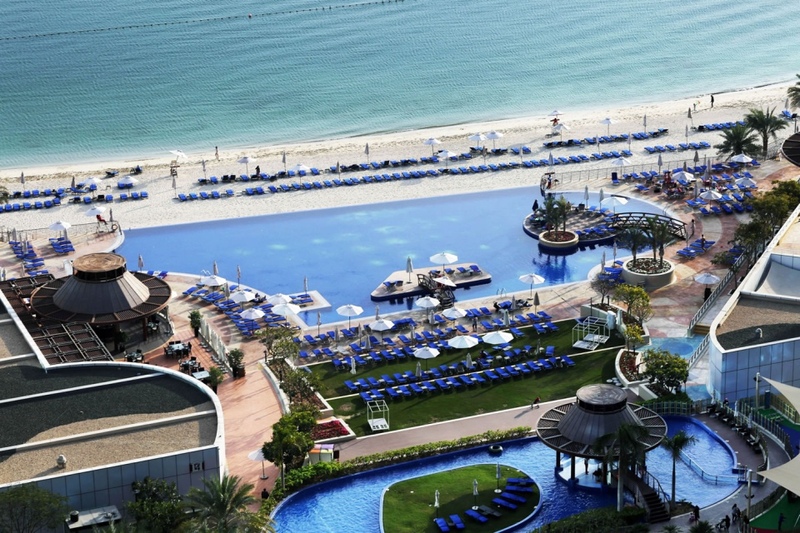 Feast on a vibrant Middle Eastern spread while splashing around in crystal blue waters. In addition to pool access, brunchers also get complimentary access to the beach. Unwind after a belly-busting brunch with a stroll by the shore. MenuPages.ae recommends: Fish saffron tagine, smoked frekeh with lamb, and the Shisha Colada. Good to know: Brunch is priced at 314 dirhams for soft drinks and 399 dirhams for house beverages. Friday and Saturday brunch runs from 12:30PM to 4PM. Turn your Friday into a fiesta with Maya's fiery Mexican brunch. Soak up the sunshine and the electric weekend vibes at this hip and happening Latino lounge. Sway to addictive South American tunes while indulging in the finest array of authentic Mexican food and bevvies. Chase your tequilas with sizzling fajitas, signature nachos and guac, refreshing ceviche and more! MenuPages.ae recommends: Octopus ceviche, Tacos de Carnitas, and Barbacoa Santiago. Good to know: Brunch is priced at 350 dirhams for soft drinks and 500 dirhams for house beverages. Both packages include spa access too. Friday brunch runs from 12.30PM to 4PM. Dukesy's motto is leave no bruncher behind, including little ones. The brunch offers kids as much fun as it does adults, with a special focus on themed weekends. From pirates to princesses, kids can enjoy a range of uniquely-themed games and workshops. Belly up with a live pasta station and sink your teeth into a whopping serving of tender BBQ meats on the side. MenuPages.ae recommends: West 14th burger and the Black Forest sundae. Good to know: The brunch is priced at 265 dirhams for soft drinks, 395 dirhams for house beverages, 445 dirhams for sparkling beverages, and 545 dirhams for premium beverages. Kids aged six to eleven dine for 133 dirhams. Friday brunch runs from 10AM to 6PM. Zero Gravity is the perfect destination to up your drink and tan game simultaenously. Enjoy four sun-kissed hours of brunch, bubbly, and beach vibes at this al fresco chill zone. Early birds can zoom in at 8AM and snag the best lounging spots. The party doesn't stop once the sun sets - stay in for Zero Gravity's notorious 5-8PM after party with two-for-one drinks! MenuPages.ae recommends: Spicy pomelo sushi roll, wakame salad, and the caramel sundae. 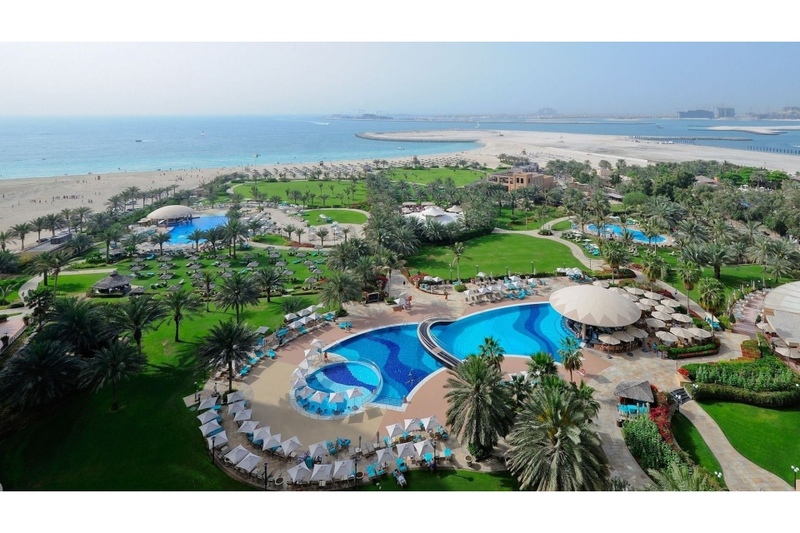 Good to know: The Ritual Pool and Beach Brunch is priced at 295 dirhams for the girls and 315 dirhams for the guys. Friday brunch runs from 1PM to 5PM. The newly launched hotel's tropocal brunch has something for everyone. Its family-friendly vibes make it a hit among brunchers of all age groups. While the adults raise a glass to the weekend, little ones can dig up some fun - literally. The brunch features a popular "dig your own veggie garden" - fresh vegetables buried in edible soil. This is just one of the several culinary attractions at the brunch. 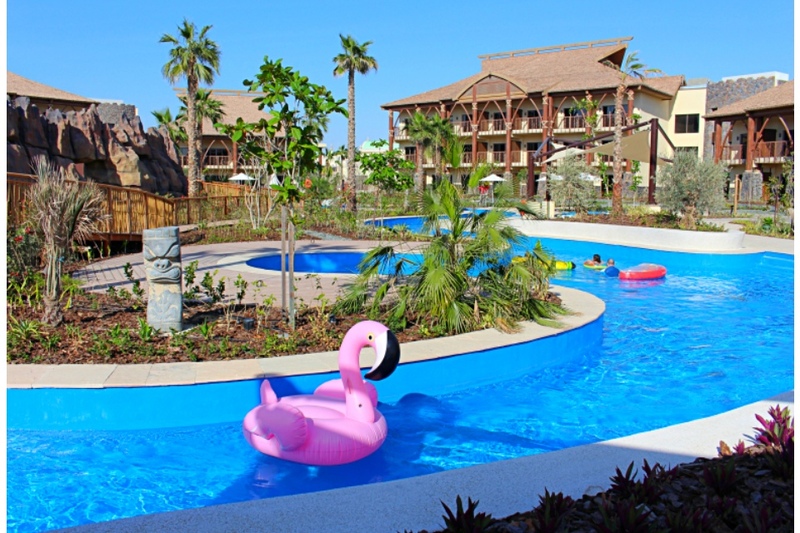 Beat the heat with some pool action in Lapita's lazy river, adult pool, or kid's pool. MenuPages.ae recommends: Hand-pulled noodles and the Fijian fish curry. Good to know: The Daycation Brunch is priced at 195 dirhams for soft drinks, 295 dirhams for house beverages, and 95 dirhams for kids under 12. Friday brunch runs from 1PM to 5PM. Staying true to its name, lose yourself in 50 shades of azure at this gorgeous beach club. 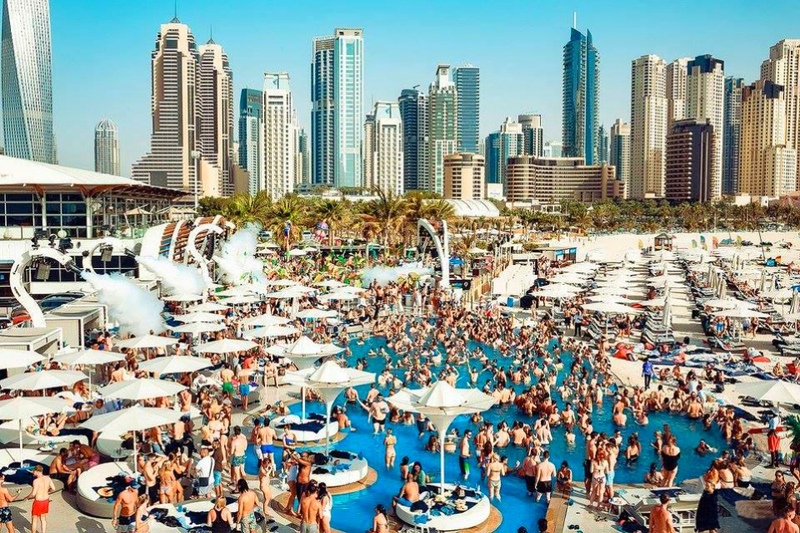 Perfect if you've got tourists in town - Azure Beach serves up nibbles and drinks to your sunbed with a side of Ain Dubai views. 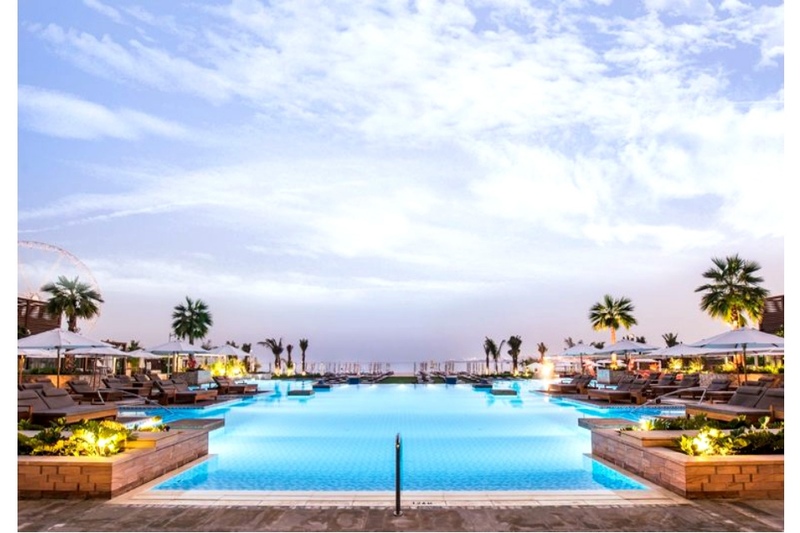 Indulge in the infinity pool, pre-game before a swim at the beach lounge, puff away on the shisha lounge, or get some sandy toes at the private beach. MenuPages.ae recommends: Sushi pizza and fruit and coconut ice. Good to know: The Take Me To Bed Brunch is priced at 225 dirhams for soft drinks, 345 for house beverages, and 445 dirhams for the bubbles package. Saturday brunch runs from 1PM to 4PM.